Make the transition to a big kid bed totally tubular with this Ninja Turtles 3D Toddler Bed from Delta Children! 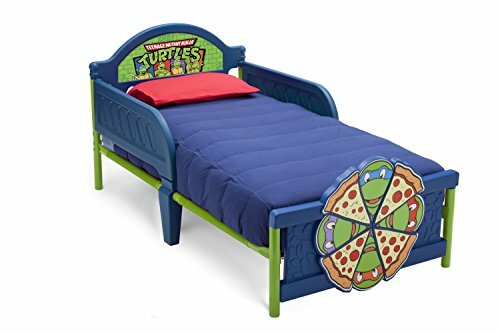 Both practical and playful, it features sleep rails at both sides, a colorful decal at the headboard and a three-dimensional footboard sporting slices of pizza and the faces of all four of the Turtles. Completely kid-friendly, it sits low to the ground for easy ins and outs, and is built from sturdy plastic and steel, so it will withstand years of use (and abuse! ).